YSofters | Y Soft RnD blog. Code only what you need! Wishing you good luck and great success in year 2019. During the infrastructure deployment, the external environment in which the product runs is prepared. First, the underlying networks are created and configured properly, including all necessary routing options. Then, the virtual machines and their network interfaces are created and configured properly. Also, all of the firewall and other security rules are applied. After the external environment is prepared and the virtual machines are deployed, the product installation can take place. First, the internal environment of the virtual machine is inspected and modified accordingly. This includes configuration of the operating system, internal firewall settings and installation of the tools necessary for the product deployment. After the environment is prepared, the product itself is installed and configured with respect to the internal and external environment (e.g. configuration of the IP addresses of other system components, assigning of the available ports, …). easier management of the infrastructure, as all configurations are exactly defined and automated. Product deployment configuration represents the necessary steps for the successful deployment of the product (or a particular component) to a single machine. This can be seen as an automated installation process, ran and controlled remotely by the deployment tools. It also consists of the product configuration, as it is usually necessary to interconnect several components of the product spread across the underlying network. Product versioning defines the exact versions of all components of the product which are to be deployed (e.g. in form of a manifest file). It is important to separate the versions of the components from the rest of the deployment configurations, as the deployment process should not depend on the particular version of the product. Note here that it is, of course, possible that future versions of the product will require different installation steps or different infrastructure setup. This separation of versions from the configuration aims to provide transparency only within a subset of versions with similar properties (e.g. minor versions within a single major release or snapshot versions between several minor releases). 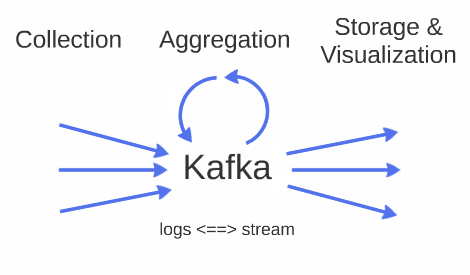 The first article introduced an overview of goals and architecture for log processing, next two articles will cover inputs and outputs – how can be data (both logs and metrics) forwarder into monitoring and how can be data viewed after the processing. There are two ways of forwarding data into monitoring platform, automatic and manual. The first one – automatic – is currently used in testing environments, where both logs and metrics are continuously collected and forwarded for processing. 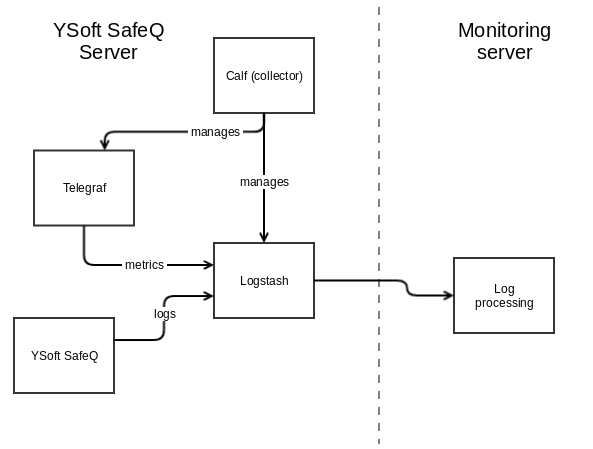 On the other hand, when YSoft SafeQ is deployed at customer’s site, such approach is seldom possible, because of security concerns and additional performance requirements for the monitoring server. Instead, only specific log files containing the problem are transferred from the customer and these have to be manually uploaded. The simplest way to forward logs would be configuring logging framework to send logs directly over the network, however, such solution does not work with network outages which can be part of tests. Some logging frameworks can be configured with failover logging destination (if the network does not work, it will write logs into files), but these files would need another mechanism to automatically upload them. Instead, logs are sent to local port into log forwarder, which has to be installed. We currently use Logstash, which (since version 5.0) has a persistent queue. If network works properly, logs are sent before they are flushed to disk, however, if there is a network outage, logs are written on a disk and there is no danger of overflowing RAM memory. There are two other goals of Logstash. The first one is to unify log formats, logs generated by different logging frameworks have different formats. That could be done on monitoring servers, but this approach makes the processing simpler. The other goal of Logstash is enhancing logs by additional info, like hostname and name of deployment group. Telegraf is deployed next to Logstash to collect various host metrics, which are again forwarder to monitoring servers. Note that Telegraf does not support persistent queue, so it sends metrics into Logstash, which provides necessary buffering. Logstash and Telegraf are installed by Calf, our internal tool. Calf can be easily configured and installed as service, it is responsible for installing, configuring and running both Logstash and Telegraf. That makes usage of both tools much easier. The main goal of manual log uploading is clear, forward logs to monitoring servers, in the same format as the previous method. That requires log parsing and adding additional information. The logs for automatic processing are generated directly in JSON format, on the other hand, logs are written into files as lines. These lines have to be parsed, GROK patterns are used for this purpose (basically named regexes). More can be found here, there is also a simple way for constructing GROK patterns. However, when manually uploading files, it is necessary to provide additional information about log file, specifically hostname, a name of deployment group and a component name, since each component of YSoft SafeQ has different log format. Logstash is again used for log uploading, but it is wrapped in a Python script for better usability. In the previous post, I wrote about testing requirements, which led us to create Modular sensor platform. I told you about ASP.NET Core technology, which can simplify developing web API server application. You could try developing your own API server. 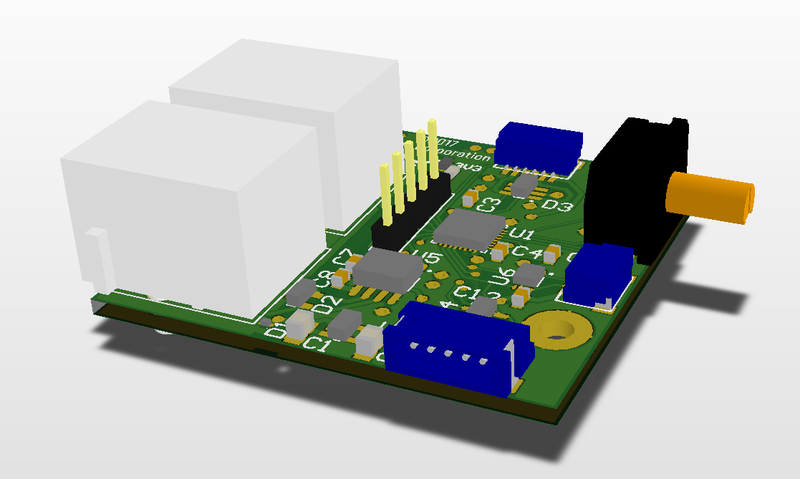 Today I am going to introduce you USB to CAN converter and universal board for connecting sensors. USB to CAN converter is the STM32F4 powered device for translating USB communication to CAN bus and vice versa. The converted is USB HID class based device. The HID class was chosen because there is guaranteed delay of packets, which is an important parameter in some cases of measuring a response time of testing devices. It is connected to the web server by USB micro and there are two RJ12 connectors on the board. RJ12 connectors are used for connecting sensors or actors (see image below). Sensors and actors can be connected to USB converter via cable with the RJ12 connector through which it is powered and it can receive and sent messages from web API server. The board on CAN bus have to be addressable by a unique address. So each device has its own encoder. Using encoder on the board, you can set the address of the device (see image below – the black box with orange shaft). The encoder is 4 bit, so you can add up to 16 different devices. The firmware is written in pure C using STM32 HAL library (Hardware abstraction layer). The initialization code was generated by STM32CubeMX, which is a graphical software configuration tool that allows configuring MCU by graphical wizards. The tool allows configuration of pin multiplexing, clock, and other peripherals configuration. Then you can generate C project for any common embedded IDE. Both PCBs were designed in CircuitMaker by Altium, which is free also for commercial use. There is no license to worry about. The disadvantage is that you have only two private projects, others must be public (see circuitmaker.com). The article describes the hardware part of the Modular sensor platform. The USB to CAN converter and the universal sensor board for developing custom devices compatible with the platform. The concrete developed sensor and actors will be in next parts of the Modular sensor platform series. This post also describes tools and technologies that were used for developing converter and sensor board. If you are interested in developing embedded systems, you should definitely try STM32CubeMX and CircuitMaker. When will the robotic revolution come and what will be its impact? What does Industry 4.0 mean and how will it change the world around us? Come, listen and discuss this with me during a talk titled “Robotic revolution: How robots help during development and testing SW & HW” during the Žijeme IT event on the 16th of February 2018. The event will take place at the Brno University of Technology, find out more at zijemeit.cz. I will discuss how Y Soft’s Research and Development department uses robots for development and testing of SW and why we have started to use them. We implement tons of automated tests which are executed as continuous integrations. But how do we proceed when we need to test closed ecosystems which are hard to control remotely or needs to be replaced by simulators? Is robotic testing better than manual testing? What are the advantages and disadvantages of a robotic approach? And why we have ultimately decided not to stay with manual testing? Lastly, what about using simulators, can they provide trustworthy test results? I will share with you how Y Soft started its robotic development and how this is connected with students. Are students changing the world? 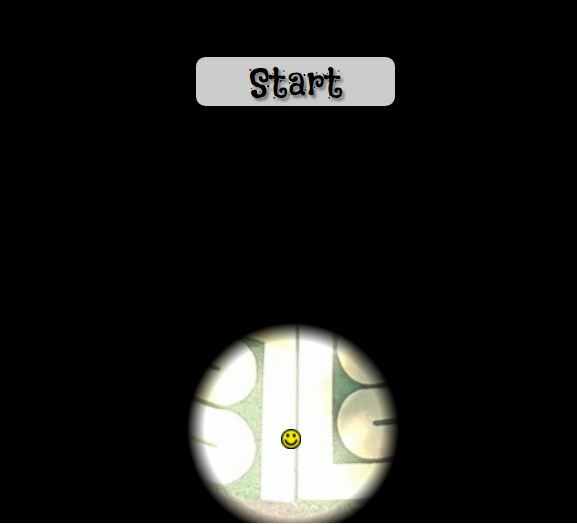 Here is small game for you. Find your way through the labyrinth. 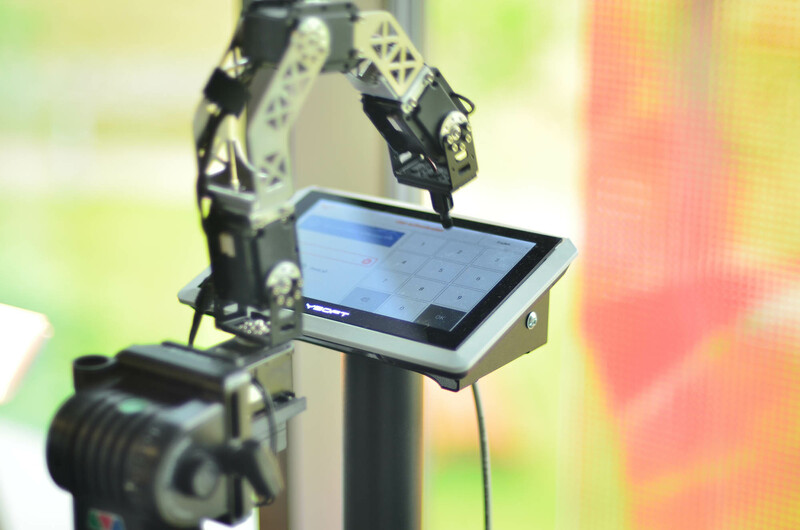 Y Soft is using a robotic arm for testing multi-functional devices, but the robotic arm is not enough for our testing purpose. We need to interact with the device in different ways than just tapping on the touchscreen. A Screen of the tested device is already captured by a camera, therefore it is needed another feedback from a device and react to that feedback. Due to that, we developed Modular sensor platform, which can be easily plugged into a computer (Web API server) by USB. Via REST API protocol you can read information or command different kinds of sensors and actors. The following diagram illustrates how the platform is composed. 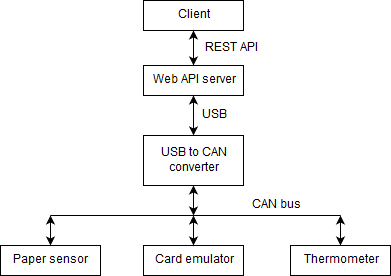 As this diagram shows you can connect multiple sensors to the server via USB to CAN converter. When the web server starts it sends discovery packet. From the responses, the web knows what types and how many sensors are connected. After initialization, it starts listening to sensors commands from clients. The web API server is written using ASP.NET Core framework. In the following link, you can find a tutorial, which shows you a simplicity of creating a RESTful application and from which components the server is composed. The .NET Core is cross-platform so the web server can run on any device running Linux, macOS or Windows. Try to create ASP.NET Core application based on tutorial above or you can just create a console application (see link). The Created application can be built for any supported OS, for ARM there is available only runtime, not SDK for developing an application (see SDK support, ARM Runtime). to ARM device and run the application. This article shows the composition of parts of the platform and how parts communicate with each other and that the platform is not limited only to one operating system. It works with Windows, Linux, macOS, even on ARM architecture. In next part of an article, I will tell you about the development of USB to CAN converter and sensors. process during software development and in production. Chef can, in cooperation with other deployment tools, transform the whole product environment into infrastructure as a code. Upon executing, Chef will make sure there exists a defined file and has the correct content. If the file with the same content already exists, Chef will finish without updating the resource, letting developers know the environment has already been in a desired stated before the Chef run. The resources have build-in validations ensuring only the changes in configurations are applied in an existing environment. This lets users execute recipes repeatedly with only minor adjustments and Chef will make the necessary changes in your environment, leaving the correctly defined resources untouched. This is especially handy in a scenario when an environment is already deployed and developers keep updating the recipes with new resources and managing configurations of deployed components. Here, with correctly defined validations, the recipes will be executed on target machines repeatedly, always updating the environment without modifying the parts of the environment which are already up to date. In this example, the goal is to download an exe file and run it exactly once (only the first run of this recipe should update the environment). The maven resource internally validates, whether the given artifact has already been downloaded (there would already exist a file C:\utils\tool.exe). The problem is with the execute resource, as it has no way of checking whether it has been run before, thus potentially executing more times. Users can, however, define restrictions themselves, in this case, the not_if attribute. It will prevent the resource to execute again, as it checks the existence of the tool output from previous runs. To enable environment provisioning, Chef operates in a client-server architecture with a pull-based model. Chef server represents the storage of everything necessary for deployment and provisioning. It stores cookbooks, templates, data bags, policies and metadata describing each registered node. Chef client is installed on every machine managed by Chef server. It is responsible for contacting Chef server and checking whether there are new configurations to be applied (hence the pull-based model). ChefDK workstation is the machine from which the whole Chef infrastructure is operated. Here, the cookbooks are developed and Chef server is managed. A developer creates/modifies a cookbook and uploads it to the Chef server. Chef client requests the server for changes in the recipes. If there are changes to be made, Chef server notifies the client. The client initiates a Chef run with the new recipes. Note here that in a typical Chef environment, Chef client is set to request the server for changes periodically, to automate the process of configuration propagation. When only the deployment of the environment is necessary (e.g for a simple installation of a product where no provisioning is required), in an offline deployment or while testing, much of the operational overhead of Chef can be mitigated by leaving out the server completely. Chef client (with additional tools from ChefDK) can operate in a local mode. In such case, everything necessary for the deployment, including the recipes, is stored on the Chef client, which will act as a dummy server for the duration of the Chef run. 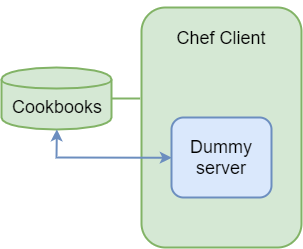 Chef client deploys a dummy server and points it to cookbooks stored on the same machine. Chef client from now on acts as the client in the example above and requests the server for changes in the recipes. Chef Server notifies the client of the changes and a new Chef run is initiated. Chef is a promising tool that has a potential to help us improve not only the products we offer, but also make the process of development and testing easier. In combination with infrastructure deployment tools (like Terraform) we are currently researching, automatization of product deployment and provisioning can allow our developers to focus on important tasks instead of dealing with the deployment of testing environments or manually updating configuration files across multiple machines. Terraform is a command line tool for building and changing infrastructure in a safe and efficient matter. It can manage resources on most of the popular service providers. 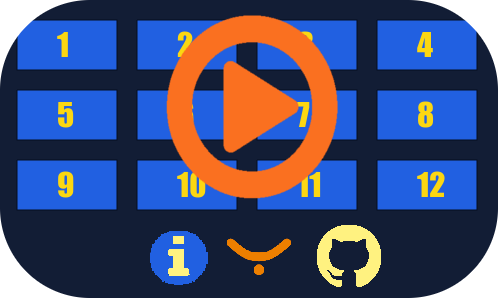 In essence, Terraform is simply a tool that takes configuration files as input and generates an execution plan describing what needs to be done to reach the desired state. Do you need to add another server to your cluster? Just add another module to your configuration. Or redeploy your production environment in a matter of minutes? Than Terraform is the right tool. Configuration files that define infrastructure are written using high-level configuration syntax. This basically means that blueprint of your production or testing infrastructure can be versioned and treated as you would normally treat any other code. In addition, since we are talking about code, the configuration can be shared and re-used. Before every Terraform execution, there is planning step, where Terraform generates an execution plan. The execution plan will show you what will happen when you run an execution (when you apply the plan). This way you avoid surprises when you manipulate with your infrastructure. How does Terraform determine the current state of infrastructure? The answer is the state file. State file keeps the information about all the resources that were created by execution of the given configuration file. To assure that the information in state file is fresh and up to date, Terraform queries our provider for any changes of our infrastructure (and modifies state file accordingly), before running any operation, meaning: for every plan and apply, Terraform will perform synchronization of a state file with a provider. Sometimes this behavior can be problematic, for example querying large infrastructures can take a non-trivial amount of time. In this scenarios, we can turn off the synchronizing, which means the cached state will be treated as the record of truth. Below you can see the picture of the whole execution process. In our example, we will be working with the azure provider. The example configuration files can be used only for the azure provider (hence the configuration files for different providers may and will differ). In our example, it is also expected, that we have set up terraform on our machine and appropriate endpoints to provider beforehand. The presented configuration file has no expectations regarding previously created resources and it can be executed on its own, without the need to create any resources in advance. location            = "West US 2"
location              = "West US 2"
Now we browse into a directory with our main.tf file and we run command terraform init, which initializes various local settings and data that will be used by subsequent commands. Secondly, we run command terraform plan, which will output the execution plan, describing which actions Terraform will take in order to change real infrastructure to match the configuration. The output format is similar to the diff format generated by tools such as Git. If terraform plan failed with an error, read the error message and fix the error that occurred. At this stage, it is likely to be a syntax error in the configuration. If terraform plan ran successfully we are safe to execute terraform apply. Throughout the whole “apply” process terraform will inform us of progress. Once the terraform is done, our environment is ready and we can easily check by logging in to our virtual machine. Also, our directory now contains file terraform.tfstate file, which is state file that corresponds to our newly created infrastructure. This example was only a very simple one to show how configuration file might look. Terraform offers more on top of that. Configurations can be packed into modules, self-contained packages that are managed as a group. This way we can create reusable parametrizable components and treat these pieces of infrastructure as a black box. Besides that, Terraform can also perform a provisioning of VM and much more.